7 Kids and Us: Showaflops are Flip Flops for the Shower! Showaflops were created with the idea that when we go into a public shower, like at the beach, or the gym, that we don't protect our feet from the dirty floor. 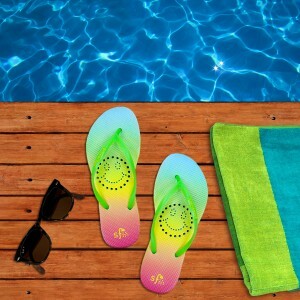 We can't see what germs are hiding there, and what we are picking up and bringing home with us, so Showaflops are a quick drying flip flop that you can wear into the shower. Showaflops come in a variety of sizes for men, women and even kids! You can check out all the styles and purchase them here.